A 2-page printed flyer (Issue #16) distributed at the Family Court and other places on Jan. 16, 2007. 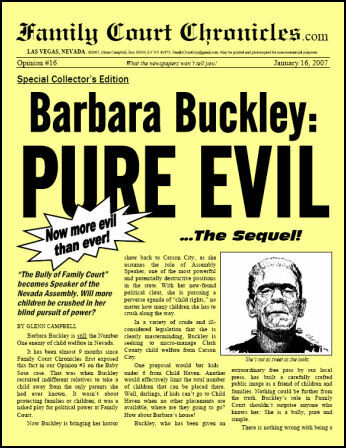 Now Buckley is bringing her horror show back to Carson City, as she assumes the role of Assembly Speaker, one of the most powerful and potentially destructive positions in the state. With her new-found political clout, she is pursuing a perverse agenda of �child rights,� no matter how many children she has to crush along the way. In a variety of crude and ill-considered legislation that she is clearly masterminding, Buckley is seeking to micro-manage Clark County child welfare from Carson City. 1/9/07: Family Court judge bars media from neglect case: German woman was to be tried in absentia in injuries her daughter suffered in August, Las Vegas Review-Journal. Features a CAP attorney saying that a 3-year-old doesn't want to go back to her mother, based on his discussions with the child. As far as we can tell, this attorney has no training in child psychology, and we doubt that any trained psychologist could make this kind of statement. 12/10/05: New law keeping siblings together adds to placement problems, Las Vegas Sun. Includes quote from Buckley saying that her law isn't to blame. 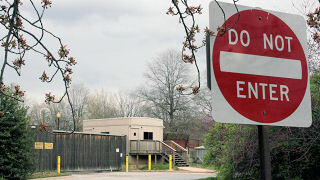 1/12/07: Proposals leave Child Haven officials uneasy: Emergency shelter may face new licensing, capacity rules, Las Vegas Sun. This last article discusses the two legislative proposals mention in our newsletter: restricting children under six and imposing licensing requirements that would limit capacity. 9/7/06: CHILDREN'S ATTORNEY PROJECT: Child Haven infants get lawyers: Group to represent 58 minors in Clark County officials' care, Las Vegas Review-Journal. This last article describes the "publicity stunt" referred to at the end of our newsletter, complete with a photo op in front of Child Haven. The sum total of the CAP's intervention in these 58 cases was two appearances in court. (Far more time was devoted to their press conference.) When most of the most of the 58 children were moved to other placements, the CAP loudly took credit, even though it would have happened anyway. Also see our our other Newsletters.